The Ricoh multifunction (print/scan/copy) printers require a code unique for each user in order to successfully print in color and to do other functions. 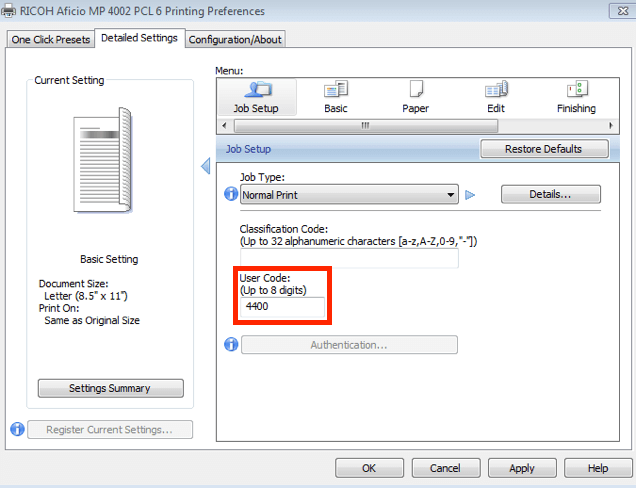 Once the printer is added to your system so you may print to it, please follow these instructions so your print code is saved to the system so manually entering it is not needed. For Windows computers, do the following steps. Go to the Start button and click on it. Select Devices and Printers from the menu, or click on the Control Panel and then on Devices and Printers. You should see the Ricoh on the screen similar to the below. 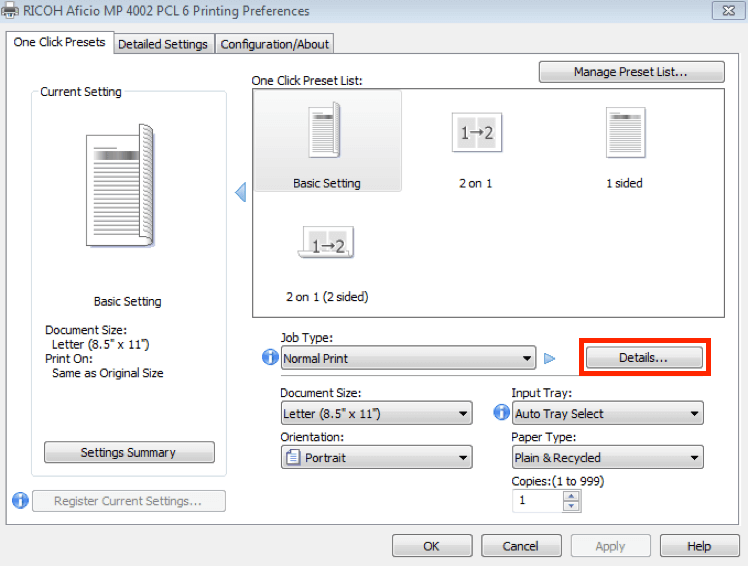 Right-click on the Ricoh icon one time and select Printing Preferences. Click on the Details button as shown below. In the Job Type Details windows which comes up, click on the box on the right hand side under the heading Enter User ID: and enter your Copy / Job Accounting Code into it as shown below. Click on the OK button when done. Select the Detailed Settings tab, then the Job Setup Menu item. Enter the Copy / Job Accounting code into the User Code box. This step is shown below. Select Apply and close all of the open windows. You should be able to print without needing to put in your code manually each time. If you have any problems with these steps, please contact the IT Services Desk. You may call us at 304-876-5457 or email us at itworkorder@shepherd.edu to create a ticket in our work order system. For Macintosh computers, instructions will be posted when available.